The French Art Colony’s 2017 summer concert series, Hot Summer Nights, wrapped up Thursday evening, with a performance by Hurl and Friends, pictured. Hurl and Friends were joined for a number by Jorma Kaukonen, member of the Rock and Roll Hall of Fame and former member of Jefferson Airplane and Jefferson Starship. Kaukonen also owns Fur Peace Ranch in Meigs County. 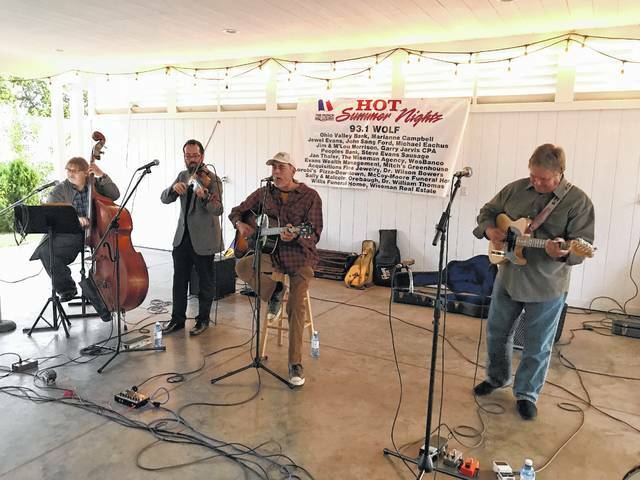 Pictured are Hurl and Friends members John Hurlbut, the long time ranch manager at Fur Peace Ranch on guitar and vocalist; Skott Brown on violin/mandolin; Mike McGannon on banjo/guitar and Terry Douds on upright bass. Look for Hot Summer Nights to return next year. https://www.mydailytribune.com/wp-content/uploads/sites/42/2017/09/web1_9.9-Hurl.jpgThe French Art Colony’s 2017 summer concert series, Hot Summer Nights, wrapped up Thursday evening, with a performance by Hurl and Friends, pictured. Hurl and Friends were joined for a number by Jorma Kaukonen, member of the Rock and Roll Hall of Fame and former member of Jefferson Airplane and Jefferson Starship. Kaukonen also owns Fur Peace Ranch in Meigs County. Pictured are Hurl and Friends members John Hurlbut, the long time ranch manager at Fur Peace Ranch on guitar and vocalist; Skott Brown on violin/mandolin; Mike McGannon on banjo/guitar and Terry Douds on upright bass. Look for Hot Summer Nights to return next year.